Who Dat getting a ride with Royal Coach to the Saints games? The Saints regular season may be winding down, but the playoffs are right around the corner. It’s time to start planning how you are going to get to all the playoff home games this postseason. Game day is the best day and in New Orleans, we celebrate the Saints ALL DAY LONG. Win or lose, fans know how to party. Unfortunately, sometimes that can get you into trouble. In Orleans parish there were 693 DUI arrests in 2016, making it one of the top places to get arrested for drinking and driving. Luckily, you can avoid DUI penalties and still cheer on the boys in the dome. Let Royal Coach Limousine take you to the Saints game in style, so you can enjoy everything that game day has to offer! 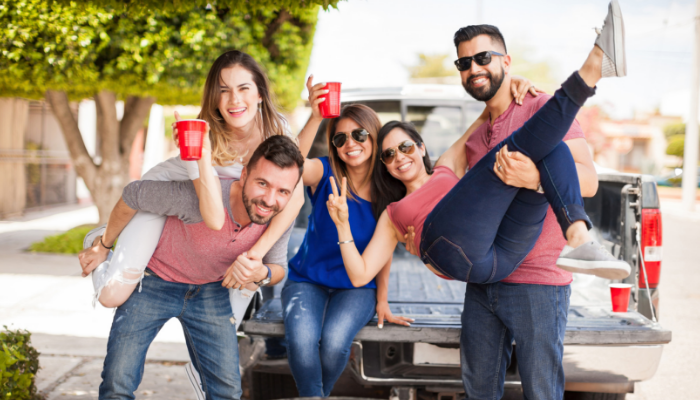 At Royal Coach, you and your friends can rent the ultimate party bus or stretch SUV limousine and travel to the Saints game to tailgate without missing any of the action. In fact, from the moment we pick you up, you can start enjoying your game day, while we worry about the driving. Our party bus is equipped with a bar, decorative lighting, flat screen TV, and DVD player. Our limos have a bar and TV with DVD player as well, so you can pop in your favorite Saints highlight reel to get crunk on the way to the game! Our professional Chauffeurs will pick you and your group up and take you to the Mercedes-Benz Superdome to cheer on our boys in black and gold. When the game is done, we’ll be there ready to take you anywhere you want to go, so you can continue the fun. Looking for a unique Christmas gift for someone special? Why not give them a priceless experience and make it unforgettable when you choose a Royal Coach Limousine vehicle! You can rent from any SUV, limousine, or party bus from our impressive fleet and make game day even more memorable. Plus, no one has to be the designated driver, so everyone gets to enjoy the fun. From the Northshore to the Westbank, our professional chauffeurs are the best in the business. In fact, Royal Coach Limousine is the top-rated limousine company on the Northshore. Tailgate the best way possible this season with a party bus or limousine rental from Royal Coach. With the Saints heading into the postseason and Pelican games firing up, you can party in style with a party bus or stretch limousine on your way to the game. Contact us or call us today at (985)875-0723 and we can help you choose the option that is best for your game day needs.